I know there are designers who look down on the process of plundering the past for new design ideas, but I can’t help but love a good modern re-working of a retro design. 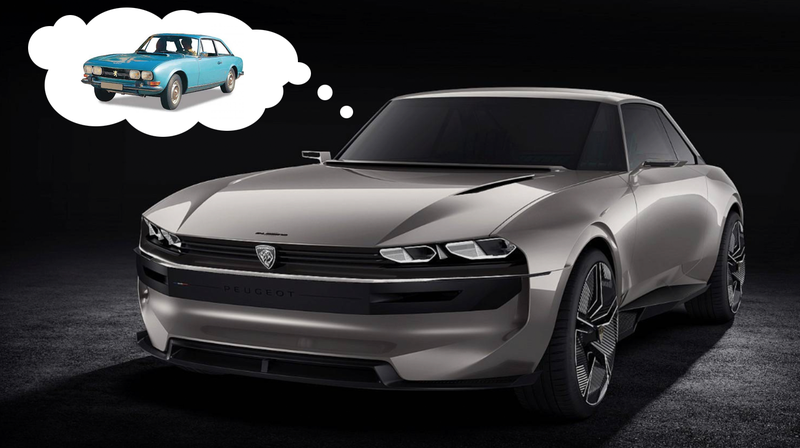 Peugeot’s stylists must have found a Peugeot 504 Coupe in some storage garage and fell in love, because their new electric and autonomous concept car is a big mash note to the old, handsome coupe. It was teased earlier this week, but now we get to see it all. Notably, the video also makes a point to show, complete with an exciting unfolding and sliding-out process for the driving controls, that the car can also be driven manual, as Acceleron, the god of driving, intended. The concept is really quite handsome, with the same graceful and athletic proportions of the original, pillars that feel impossibly thin in this era of airbags crammed into everything, and the whole crisp ‘60s look updated with a very modern design vocabulary. I especially like the rear, with the nice update to the original’s striking (and slightly Mustang-like, to American eyes) triple-slash taillights. I think there’s a lot to like here, design-wise, and I’m delighted to see a major automaker showing something called a coupe that actually only has two doors. Finally. Come back to the US, Peugeot!